One major part of The Question Evolution Project is to be an information resource. Here is (to use the technical term) a bunch. Bill Nye the "That Guy" Guy (who seems to have a new way to refer to Ken "There is a Book" Ham) is so committed to materialism and evolutionism that was condescending, and he resorted to misrepresentation, false assertions and even blatant untruths to convince people to believe in his point of view during the famous debate with Ken Ham. (Can you say, "Liar for Darwin"?) The debate prompted some people to think for themselves instead of drinking the Dar-wine, and they are investigating what creationists actually believe and teach. Unfortunately, there are people look up to Nye as a great scientist despite his disingenuous presentations, bad reasoning, anti-Christian bias, refusal to answer questions or examine evidence, and speaking beyond his limited areas of qualification. They parrot his statements and outdated "arguments" in their attacks on creationists (many of which have been linked to from here). People who know how to think critically and examine the evidence for themselves should train themselves to say, "Wait a minute!" when people like this will make assertions. For instance, "annual tree rings". Wait a minute. Are they really annual, one ring per year? That is not a consistent event because during proper conditions, trees may skip a year or produce several rings in one year. Or a slide of skulls presented as evidence for evolution, "no gorilla skulls" there. Wait a minute. That went by so fast, what are they really? Not gorillas, but not human, either. And definitely not evidence for evolution. A huge ship was built that sank. Wait a minute. One ship that sank, after it had been in use for fourteen years (a fact he conveniently omitted) somehow disproves Noah's Ark? Don't let people slip things by to trick or intimidate you that they are evidence for evolution or evidence against the Bible. Here are several items to answer Bill Nye. People should try to put aside their evolutionary presuppositions and actually consider the material. Answering Bill Nye: What Do Ice Cores Reveal About the Age of the Earth? 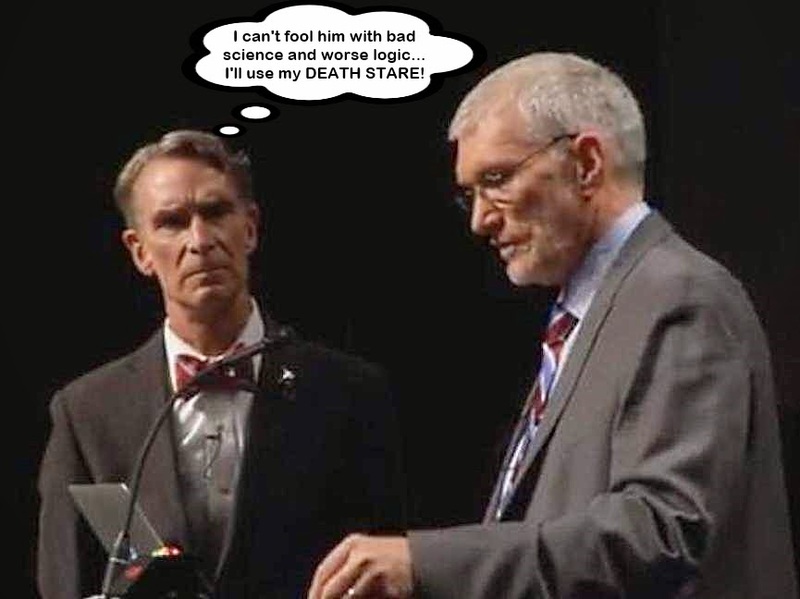 Answering Bill Nye: Would Unexpected Positions of Fossils Change an Evolutionist’s Mind? Answering Bill Nye: How Did Animals Spread All over the World After the Flood? Answering Bill Nye: Should We Expect Biblical Creationists to Be Able to Make Great Scientific Discoveries? Answering Bill Nye: How May We Understand the Observable Expansion of the Universe? Answering Bill Nye: Can We Trust Our English Bibles? Answering Bill Nye: How Could Noah Have Built the Ark? Answering Bill Nye: What Do Fossil Skulls Suggest About Modern Humans? Answering Bill Nye: Can Natural Laws Change? Of course, fifteen-minute radio episodes can only address a limited amount of information. So the nice people at Answers In Genesis have provided a number of articles (several of them are technical) on these subjects. You can find the wealth of information at "Debate Answers". This is an exciting time to be a creationist, the evidence is on our side — and there is a great deal of it.